“ I call it a fast forward slow motion trip ” – It’s true! 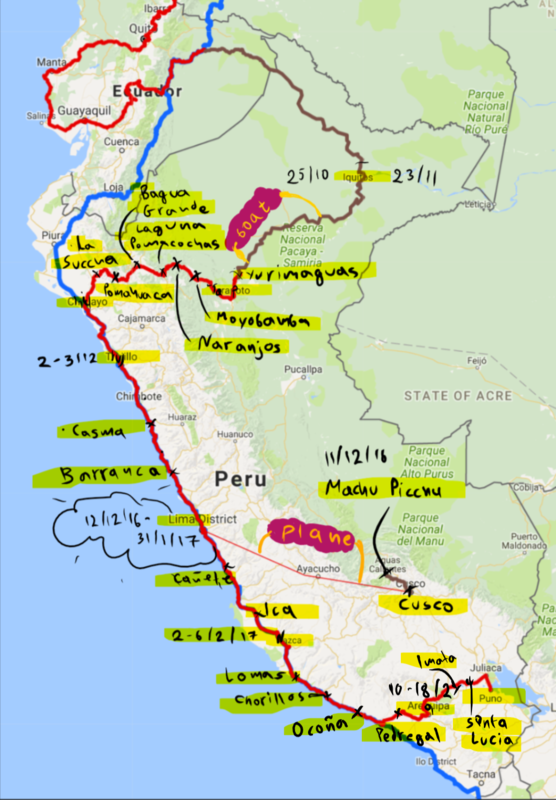 I can ride 250 km in one day, 601 km in 3 days in a row, and 1800 km in 2 weeks, and at the same time I can spend 4 months and 1 week in only one country: Peru! Iquitos was the first place I stayed for a long time in Peru. I spent one month there. Why? Because it was my birthday! And by that I mean my travel birthday. 1 year on the road.. I wanted to make a video summing up all the beautiful moments. And I wanted it small.. not 30 minutes… I was very lucky that my friend George from Athens had already done a first scan+edit but I also needed myself to see literally hundreds of videos from my first year, and after drinking enormous amounts of coffee, to end up with this. One of the things I enjoyed the most in Iquitos was the Sunday nights out. I was walking with friends or alone and it was really a very pleasant thing to do.. Enjoying a nice drink of aloe vera, called emoliente, and watching all of these beautiful stuff. However, I need to mention that my time in Iquitos was really intense because some other things happened too, related to the 3 hostels I changed. I had never in my life made so many bad thoughts about someone…Luis, from Puerto Rico (or Costa Rica, not sure) was one man that was working there. 35 approximately. Luis was responsible for the whole hostel during the evenings. He was usually leaving for 10-30 minutes, letting me know about it, in order to unlock the door, welcome the newcomers etc. One night he left, there was nobody inside, I was waiting for him outside for half an hour , I wanted to go to the toilet. He comes, says nothing, opens the door. I am telling him the following day “man, you didn’t even say sorry – it’s your job to be at the door from 1700-0000. ” – “oh yes”, he responds, “sorry sorry”. But in a way like saying “ok ok, I don’t care”. Next afternoon he wanted to leave again. He says “Ageluuus ya vengo, ya vengo” = “now I am coming..” I am telling him “no man, you are not coming, you are going, and I don’t care. I am here in the pc, with my headphones, I have to finish what I am doing. It’s your job to be at the door. I have nothing to do with that”. He says “ok, ok”. He leaves. Someone enters into the hostel, goes to the first room, steals the Iphone of a French lady, locks from the inside and leaves. I didn’t understand anything. Luis comes, he’s telling me “why the room is locked?” I have no idea. They have no other keys. The 4 French ladies that they are the only ones that stay in the room, come. The Iphone is missing. I start accusing him because he left leaving the door open. He understands that it’s his fault and says “I was inside when this happened and I saw the man exiting the corridor… (a total lie, that apart from nonsense, it was also stupid)”. French lady is crying, I am mad with his lies and the fact that he doesn’t accept it’s his fault. I demand that the owner of the hostel come. She comes with 3 more friends.. We discuss for about an hour, maybe more. It was very difficult to discuss with these (uneducated) people. Logic, arguments, reasoning, conditional speech… Unknown to them. Mañana sales, vamos a solucionarlo yo y tu afuera del hostal. Tomorrow you are leaving, we will find a solution to this, you and me, outside of the hostel. French lady left the following day with her friends. I didn’t. I was sad for this man. I tried to help him when I stopped being angry and sad (after a week or so). “Friends” again.. Nothing.. Pure disappointment. Some people, only by being, by existing, they insult Life. They are trying to avoid Living in many ways… They don’t really feel, they don’t really connect, they are lying all the time, they don’t try for nothing. You see them, being there, doing nothing, thinking nothing, caring about how they will mock someone so they ‘ll get something without effort. This man, after my attempt to be OK with him again, tried to accuse me for something in the eyes of a tourist at the hostel. First time after my childhood that I got up from my seat and moved to his side to punch him!!! I would never punch someone (I think) but I was SO furious. “Don’t look at me again” I told him “don’t talk to me again”. I was transparent for 3 more days and then Ieft. Hard to concentrate under these circumstances. I left and went to another hostel. La casa de Frances. I focused a lot on my video. I was full. Of emotions, of things to do, I was under pressure.. God sent at that hostel a Greek man of great soul, my age. At last I speak some Greek – I communicate. He was the valve in my pressure cooker. I spent 3 days without doing anything. We talk all day and drink beers. He leaves. I am back to life on a crazy schedule. Doing what I felt like doing. I did a huge campaign for promoting the video. I must have sent more than 150 messages, in Greece and abroad. The vast majority, personified. I was not copy-pasting. Not only for promoting the video, but the trip too. I am running out of money and I am trying to think how I can generate money without working from place to place. If need be, I am doing it, 100% . I am not going back to Greece due to lack of money. I write it now and I am laughing, of course not. All good though, I am very positive. I left Iquitos and hopped into a big boat that goes through the river until a city called Yurimaguas. Iquitos is the largest city in the world that has no access by land. It was hot, humid, with lots of mosquitos. but… no problem! I was in the mood for riding, baby! 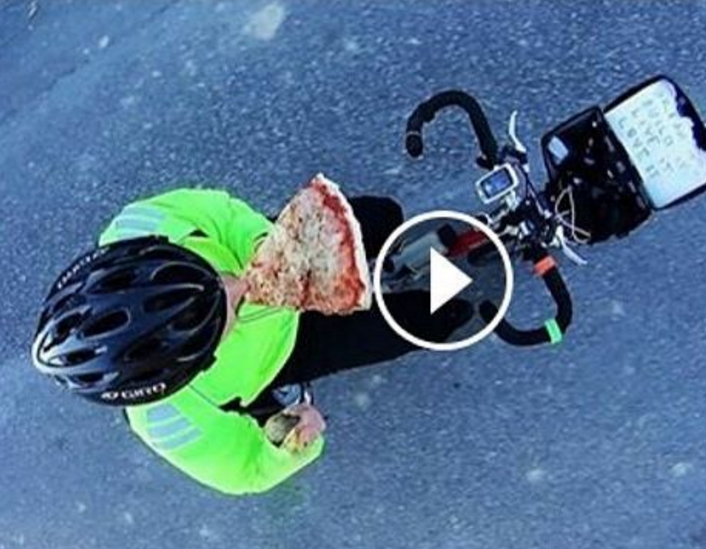 I had 1 and a half month without cycling.. Drinking beers and coffee and eating chocolates – disgusting! Some 50 km before Lima. Only trucks! However, that was just a bad moment in a very beautiful and colorful journey, a defective pixel in a full HD screen, a rotten lentil in an awesome lentil soup. Enjoy the video.. I came to Lima on time! Seemed impossible really! I met my friend George who came from California in order to take a flight to Cusco, the capital of Incas! From there we would then go to Machu Picchu!! They don’t want to make their life better? Should you complaint/ express your disappointment / possibly engage in a verbal quarrel with them? My opinion is YES! Of course you should, for the sake of them and for the future receiver of their service. If nobody complaints “just to get his/her job done quicker and don’t complicate stuff” then they have no feedback and they will always be, to say the least, annoying. We are walking our magical pathway to go to Machu Picchu. – Now they are five! – Yes, now they are five..
Rubbish everywhere! I love Peruvians, they are very friendly and we are having very good time… but so many rubbish…. Everywhere!! It was for me very important to share with a friend some things in regard to the trip. Thanks George!! Googled and asked around about the largest bus station in Lima. I went there and started looking for hostels – the hostels that local people go. Either they were telling me that I cannot stay for so long or they were way more expensive. At some point I am approached by Oscar, a smiley cyclist. He is around 50 years old and asking if I need any help. I told him I was looking for a place and if he could suggest something. Oscar in front of the Lima Cathedral, Plaza de Armas. He is telling me “where I live, there is a room, that has it’s own door and you ll have your shower, and your keys, and you can use the kitchen. But we have to ask first the lady that owns the place. We went there, we asked. The lady, señora Julia, is an angel. She said yes. I stayed there for almost 50 days, waiting for a package to arrive (I had some logistical issues), and doing some stuff online, and sending cards. Señora Julia, on my left. The deal was to pay 10 soles (2.7 euros) and have my own room (finally), where I can have my stuff untidy and don´t care if they ´ll be stolen or not. I had my private space after 9 months in South America. I had wi-fi and I was eating with the family at least once every day. If not, there was a public restaurant (comedor) very close, that I could eat for 2 soles an enormous amount of food. (something came in Greek, I wrote it). The “weather” is the the place to go when you are looking for something to say, either because you hadn´t said nothing before, or because you have nothing to say after. I love Señora Julia. She reminds me of what I have named somewhere Mothers of the Earth. Mothers that from the first time they look at you, they treat you like their child. ** here in Peru, it´s typical in New Years Eve to make 12 wishes while eating 12 grapes. I feel very fortunate to share my wishes with the Family and also listen their wishes too. – From now on, when hosted, I have to be very careful on things I do, but mostly, on things I say. With the family, with the neighbors, with everyone. Because they are friendly it doesn’t mean that they all have good relationships with each other. A misunderstanding took place that made me very sad, I apologized and things got OK.
– some people, literally LIVE through Facebook.. I am astonished. – on the contrary, I played football with the guys there and we were drinking our beers at night. On Friday and Saturday nights you walk in the street and there are many many groups of 3-7 people, of all ages, mainly but not limited to men, that are together, sitting on benches, or in the doors of houses, that they drink their beer. There is always music coming from somewhere. What I like is the way they drink! They have one bottle of beer and one glass. You put your beer in the glass and give the bottle to the next one, you drink and pass the glass. This may happen for 8 hours…. But there is always one bottle open. In New Years Eve there was a box with 10 beers in the center of the circle, around it we were dancing. But only one beer open. Very beautiful. – There was also a lot of cocaine there. They offered, I didn’t accept and it is ok for them. If I don’t accept beer, they are kind of insulted. – I fell in love in Lima. With a dog. Her name was Laika. First lady that peed herself of joy when touching her. Hehehe. I miss her. – and I was particularly worried because I couldn’t be at my brother’s becoming-a-father moment, TWINS!!! – I walked one day for 6 hours in order to meet my friend Shirley and have a Friday night out. I did more than 20 km and I liked it a lot. – I ate the best ceviche of my life at the Cevicheria of my friend Shirley! Potatoes that were buried for one year! Delicious! I was feeling so nice alone. Calm and peaceful. What I needed the most! Football and beers with these lovely guys! The plan was to leave from Lima on Monday, but when I went to the Church on Sunday I had an encounter that would change my plans. A., from Austria, has been living in Peru for the last 8 years and we had a very interesting discussion after the Holy Liturgy. He is one of the people you meet sometimes and you are like “ok, tell me more! I want to learn from you”. He is a Theologian with almost infinite knowledge on the subject, and on Philosophy, and Physics and… many more. He very kindly hosted me for one night, so when I left the lovely Sifuentes family, I went at his place only for one day. Just to discuss. We went a walk to the Catacombs, and then continued talking until 03:00 am. A. told me a lot about the hard times of the Orthodox Parish in Lima… He himself was kidnapped and he is often threatened… More on this on another post. So I left Lima on Tuesday, and I had in mind that my next multiple-day stop would be in Lake Titikaka, up in the mountains. I didn’t know that on my way there, there is Nasca, with the famous desert and the Nasca Lines. So I found myself in a place which had lots of tourist attractions and opportunities and also I was in an extremely nice hostel with Roy, the owner, who was a very sincere, intelligent and hard-working man. This guy was sleepless… partying and drinking at night with us, the customers, and waking up at 07.00 to pick tourists from the airport and go for tours..! I saw myself in him a little bit, as my life in Athens was really full. I spent 4-5 days in Roy’s Hostel and they were very very interesting. I met Stefanie and Stefie from Germany, Cooper from the States, Alicia and Eulalia from Barcelona, the Holder sisters from New Zealand, and also Renar, from Nasca, friend of Roy’s. We talked a lot and danced a lot, and, also, drunk a little bit. We also went to the desert with an awesome vehicle! Enjoy the video.. I had a very nice connection with Roy. And also with his lovely mother. He offered me to stay there and work with him and build the second floor of the hostel (oh, yes, I didn’t tell you – Roy has built the hostel alone… watching tutorials on YouTube! ), but…. the trip has to be continued, right? During the night it was… spectacular! My time in Arequipa was very very special and intense. I stayed there for 7 days, in an extremely cheap hostel (3 euros for a bed, kitchen, and descent internet connection). It was one of the hostels that tourists don´t go. Travelers yes, and mostly from South America. 7 days there I was the only one not from South America. This place was special because of its second floor. At the second floor you could find the private rooms (I was in a dormitory – 1 room, 8 beds). At these private rooms there were no conventional travelers. In one of them was Tio A., drug addict, in another one was Tio O., alcohol addict. In another one was Tio IneverLearnedHisName, alcohol addict. All of them more than 50 years old, staying in that hostel for 2-3 years, paying by day! For one reason or another they found Arequipa is a good place to make money on the street, so they… stayed there. Tio A for example was going in the streets every day with his walking stick, asking for money. He told me “people see you with the walking stick, and they just help you”. In 4 hours of “work” he could make approx. 40-50 soles (12-15 euros). He was paying the hostel (20 soles), buying his drugs (10-15 soles) and the rest was for food. More or less, this was his daily practice. Well, in this environment, in another room, I met J. and G., from Argentina, 34 and 27 years old, respectively. I spent 7 days with them, and when I left, I felt like leaving 2 brothers. Drug addicts, but diamonds. You know, there is a thing with people who suffer from this kind of addictions. They are vulnerable and they are sincere. They are fragile. They cannot hide themselves, their intentions, their feelings. I loved these 2 guys because they were beautiful souls. They were good in their heart. We cooked a lot, and spent almost all day together. With them I had some of the most beautiful discussions that I had during the trip. Genuine thought, will to learn, intelligence semi-lost in the abyss of drugs, but still there. They asked me extensively about the trip, I asked them extensively about drugs, and about their life before, and… about their life in the future. This fish is called “Bonito” = Beautiful. For the first 3 days, I was only with J.
J. was consuming drugs for a bit more than 10 years. With him I had the most intense conversation of the trip, possibly of my whole life. He told me his story and I was so touched that my stomach became a proper knot. It was very awkward and I cannot describe it in English. All the feelings of compassion I had were manifested in my stomach in a very real way. J. told me about his effort to get out of drugs, the clinics, the difficulties, the stages. J. was an athlete, a runner with distinctions, and aslo he had served in the army in a very respectable position. He was an exemplar for his family, a model to follow. And then he started drugs because he couldn’t handle some stuff and then… he disappeared! He left his house, city, country and nobody knew anything about him. After 3.5 years he returned for a couple of days and at some other point in time, later, he saw them again for a bit. Of course without saying anything about drugs. Apart from these 5 days in total he has no contact with them whatsoever – they know nothing. He told me he is very ashamed to go back. I loved this man, instantly. We spent a lot of time together, all day practically, apart from the 2-3 hours he was going to work on the street. Selling candies or just by talking, asking for money. He had worked in restaurants, so we cooked a lot together. I ‘ll miss them both, but I’ll keep them alive in my memory through my prayers. Needless to say, that during these 7 days I couldn’t do anything online. Not posting, nor facebook, mails, nothing. I wanted to absorb everything this environment had to offer. The one I did was to communicate with my family, and write a little bit in Greek. I was very touched and this encounter and the whole environment made me think… All of these people we see in the streets… They have a life so unconventional, so different. Some of them are lost, sick, they are in need of help, they don’t have real friends or people who care deeply about them. All of these -so called- marginalised people… they are real! They have a life in parallel with our. They have their anxieties, they want to get out of their vicious circle, they need help. How society is treating them? Have you ever thought about it? My next multiple-day stop would be at Puno. Where lake Titicaca is. Lake Titicaca is the largest lake in South America and the highest navigable lake in the world. Altitude: 3820 m! So you get the point. It was hard to come up here! After these days in Arequipa, I said to myself, no hostels this time. “you should not meet anyone in Puno. Stay focused on the blog.” This was because I am not satisfied with the way I keep track of my trip. I don´t like my blogposts being that large. It´s not easy for me, and nor for you I guess. I´ll start writing one post every week, maximum 2 weeks. How to make an AWESOME Pisco Sour – You just need that look when using the blender. What 10 soles (2.9 euros, 3 dollars) can offer you in Peru´s fourth largest city. This is George and myself in the minivan that took us from Cusco to Machu Picchu area. I will just say that it was the day after my… birthday! Peru has 3800 varieties of potatoes and more than 55 varieties of corn, more than anywhere else on Earth. I think that walking through the local markets is my favorite sightseeing! Decorate your wall? Change your wallpaper?